There are some people who believe that checkerboard tile floors should be laid on the diagonal. For others, straight up and down is perfectly fine. I suppose it's an aesthetic preference, though I'm sure one style is more classically and architecturally correct than the other. When I was trying to find images for this post, I mostly found floors with the tiles laid diagonally, which leads me to believe that most designers prefer this style. Which do you like? Hampshire House was one of Draper's earlier projects, so perhaps she had not yet formulated her opinion about diagonal tiles. Dorothy chose large scaled tiles laid on the diagonal for the floor at Quitandinha. 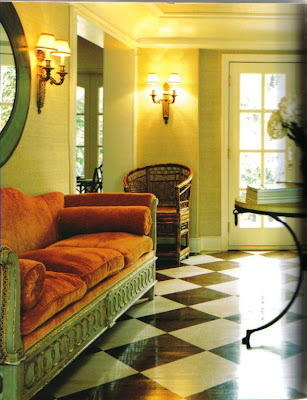 Remember this home decorated by Celerie Kemble? The tile is actually a painted wooden floor, but the faux tiles were painted on the bias. 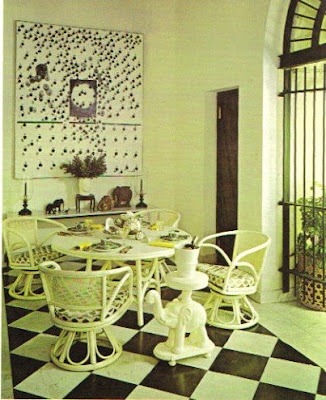 Woodson Taulbee's home in Old San Juan, decorated by Billy Baldwin. Jennifer, I'm with you -- diagonal. I'm booking it over to Paul Costello's site to look at Miles' outdoor area. Isn't the patio painted? Courtney- You've got a good memory. Yes, looks like he painted his on the bias too. expands the space, visually that is. That might have been what DD was thinking. The scale of the tiles to the room seems far more pertinent than how they are positioned. Toby- Yes, like the movie still- the scale is wrong. Or at least it looks that way to me. I think DD was adamant about 18" square tiles, though her Brazilian project shows much larger tiles. I prefer diagonal. I have had black and while tiles in my hallway that leads to my kitchen on diagonal for over 25 years and it still makes me happy. In the smaller hallway it doesn't look ditzy. Great post. I really adore Hampshire House. I actually painted a floor checkboard style in a old farmhouse kitchen. You know I love both & to me I couldn't form an opinion until I saw the room. I tend to buck the traditional, so the checkerboard in the Hampshire House spoke to me louder than the rest. It's all good! b + w panelling on the door? Have to say I am a fan of the diagonal tile look. For me it visually opens up the space, it just feels right to my eye! Not to say it is the "right" way to lay tile though. Just what I prefer. I far prefer the diagonal placement. It bring so much light, movement and energy into a room and leads the eyes to where the designer intends to take them. But it is all beautiful. Thanks. Diagonal placement of tiles does make a space seem larger and longer. However, there is a visual issue to be considered, ie depth perception. As one ages, often one's depth perception is compromised, so an elderly person walking through the space might not be able to distinguish accurately that the dark-and-light sections are flat rather than steps. Which means accidents can happen. I think it depends on the size of the room, but I tend to prefer the diagonal installation because it tends to open an area up, give an area more definition and style. Great post - I really enjoyed all of the photo installations! I definitely prefer laid on the diagonal. I think it's more elegant and makes the space appear larger. Straight is a little country living for me. I love the diagonal. Quitandinha wouldn't be the same without them. That plus the arches makes for an outstanding room. great post. 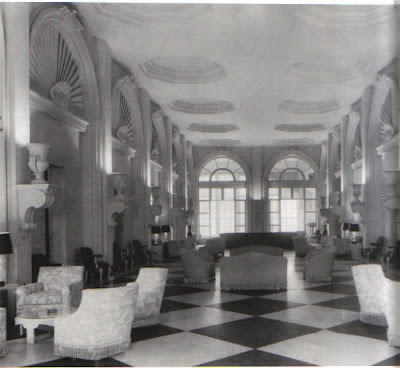 nothing beats a black and white marble floor. but the painted wood floors are mighty tasty too! Interesting question-- I suppose it depends on what level of complexity you want in the room-- but overall the diagonal ones really pop. 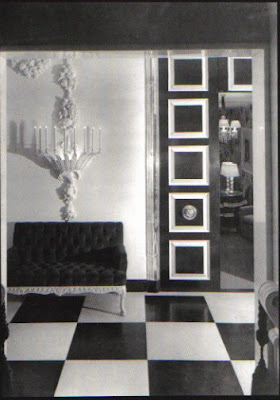 It seemed like every one of my friend's parents home had a blk/ wht foyer growing up. They were all diagonal that I can recall. I adore them. Until now I never considered the tile would be placed vertically, it seems to take the magic out of place and make it too linear. I definately love the smaller scale of the Reed floor here. There is one home in particular which will never leave me: Somehow she always had a huge bowl of heady white scented roses just beginning to go by on the table; they were wide open and enchanting. Meant to add a little scruff in an oh-so-elegant way, as I look back now. It was lovely to return to that room in my mind just now. Thank you. 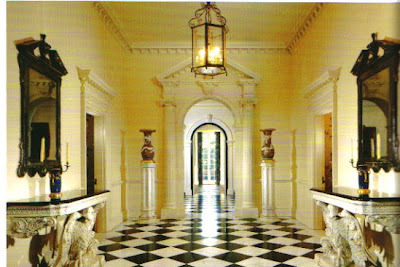 The floors at Gracie Mansion (home of NYC's mayor) are black and white painted faux marble and they're also done on the diagonal. Seems to be the distinct preference. 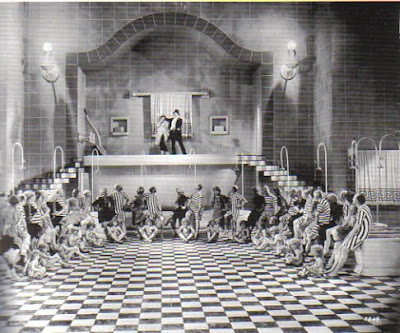 I agree with Toby about the ratio of the size of the tile to the room; the space in the movie still is huge, and the tiles RELATIVELY small, allowing for the appearance of a diagonal aspect of the pattern to come into view along the sides of the room, which would not be visible in a long narrow room. I think it works in that size of a room, but if the tiles were larger, diagonal would be a must. Some day there will be a formula...?